Game-changing tax laws have the potential to impact your business. The effects on your business depend on how you approach the opportunities and challenges that arise from these reforms. 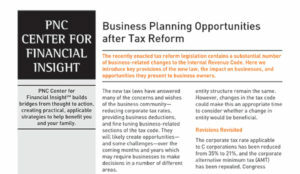 Business Planning Opportunities after Tax Reform, a thorough article released by the PNC Center for Financial Insight, analyzes the changes and their possible effect on small businesses. With an overhaul of tax rules, business owners have the opportunity to evaluate the rules and create a new financial strategy moving forward. The small business attorneys at Raffaele Puppio are well-versed in helping business owners understand new tax rules. If these are issues that you face, we are available to help.